Udaya K Vempati (2005). Mr Udaya Vempati joined the group in September 2002. In May 2005, he defended his Masters Thesis titled ""Reversibility Windows, Non-aging and Nano Scale Phase Separation in Bulk Germanium-Phosphorus-Sulfide Glasses". He will continue his study at Material Science Department, Johns Hopkins University. Fei Wang (2004). She joined the group in Sep 2000. She defended Master thesis entitled "The Intermediate Phase and Stress in Ge¼Se¾-yIy Glasses" in Oct 2002 and her PhD dissertation entitled, "Self-organization and Stress in Network Glasses" in Nov, 2004. She is now faculty at Dept of Electrical Engineering, California Polytechnic State Univ. Tao Qu (2004). Tao joined University of Cincinnati in fall of 2000. 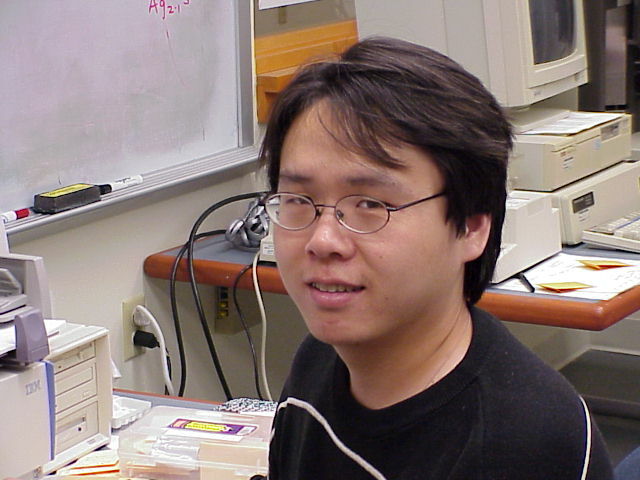 He defended his PhD dissertation entitled, "Non-aging and Self-organization in network glasses" in Jan, 2004. He is currently working at Nokia in Detroit. Luichun Cai (2003). Mr. Liuchun Cai joined the activities of the research group in January 2001. For the past two years he has examined nanoscale phase separation effects in glasses. 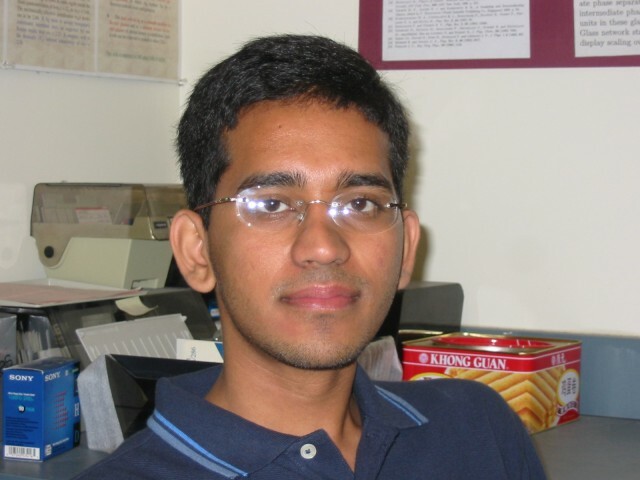 He defended his Masters Thesis entitled, "Molecular Structure of (Ga2S3)x(GeS2)1-x glasses by Raman scattering and T-modulated DSC" in May, 2003. Later he joined Material Science Department, University of Minnesota for further graduate studies. Swapnajit Chakravarty (2003). Swapnajit joined the research group in fall 2001 from Jadavpur University, India. In May 2003, he defended his Masters Thesis entitled, "Self-Organization and Aging in Network Glasses". Earlly in July, he joined Department of Electrical Engineering, University of Michigan for further graduate studies. Daniel Georgiev (2003). 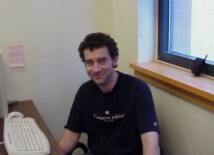 Daniel G.Georgiev defended his Ph.D. Thesis in January 2003. The title of his thesis is "Molecular Structure and Intermediate Phases in Group V binary Chalcogenide Glasses". It was recognized as an outstanding thesis by the Department of Electrical, Computer Engineering and Computer Science. Daniel is currently working on "Smart Sensors and Integrated Microsystems (SSIM) " in a multidisciplinary research group in the College of Engineering at Wayne State University as a Research Associate. Hai Tang (2000). 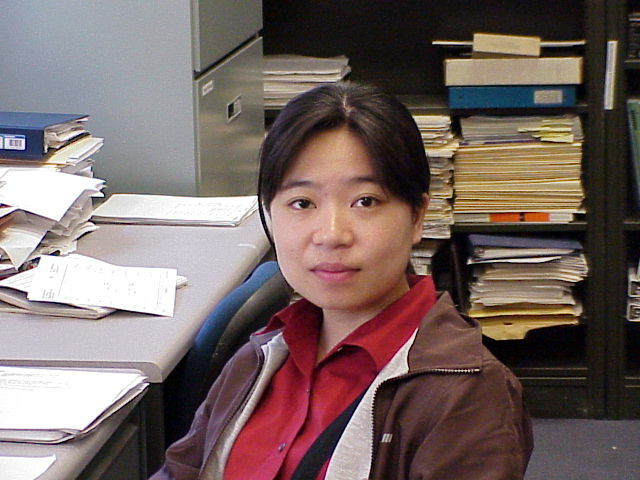 Hai Tang joined the research group in Sept 1997 from Tsinghua University in China. He worked on synthesis and characterization of bulk LaS. He defended his Masters thesis entitled, "Synthesis and Characterization of LaS", in January 2000. Hai Tang joined Qualcomm in April 2000 and is currently responsible for asic testing. Yu Wang (2000). Yu Wang graduated with M.S. in Electrical Engineering in 2000 from the University of Cincinnati. He worked for Ericsson in North Caroline till 2003 as a system engineer. He has now relocated at Texas Instruments and is working as senior system engineer in the wireless communication area at the San Diego location. Fan Shi (1999). Master Student. Deepak Selvanathan (1998). Deepak Selvanathan joined the research group in fall 1996 after a Bachelor of Technology degree in Electronics and Communication Engineering from Pondicherry Engineering College. He obtained a Masters degree in Electrical Engineering in September 1998. The title of his Thesis was, "Multiplicity of Stiffness Threshold in Si-Se glasses from Raman scattering and T-Modulated DSC". Deepak joined University of Illinois in September 1998 to pursue Ph.D. Thesis work in the Department of Electrical Engineering. At UIUC, he is pursuing research in the area of GaN and related semiconductor devices in the Advanced Processing and Circuits group. Najib El Boudakhani. Master Student. Richard Harris (August 1998). Master Student. Xingwei Feng (December, 1997). Master Student. Gordon Anaple (June 1996). Master Student. Yaoxiang Wu Ph.D. Yaoxiong Wu graduated with a Ph.D. in Electrical Engineering in 1995*. The title of his thesis was "Microscopic Signature of Superconductivity in the Cuprates Probed by the Mossbauer Effect". He was hired by Sony as a Device engineer for technology transfer, starting in November of 1994, and worked for 4 years at their facility in San Antonio, Texas. Currently he is employed as Technology Transfer Engineering Manager with Motorolla in Austin, Texas, and is responsible for semiconductor process technology transfer projects from Motorola to other manufacturers located in Asia, Europe as well as in the US. *Thesis defended in Nov. 1994 and went to Sony immediately after. Ph.D degree is granted in March 1995 by normal procedure. Min Zhang Ph.D. Min Zhang graduated with a Ph.D. in Electrical Engineering in Dec 1995. He worked for Actel Corp. for 3 years in Sunnyvale, CA. In 1998, he was hired by Motorola and moved to Austin, TX. Since Feb 2001, he is working for TSMC in Austin, TX. He recently visited Cincinnati in Jun 2009. Shekar Pradhan Ph.D. (June 1991). Shekhar Pradhan joined the research group in 1985, and worked on high temperature superconductivity. In 1990, he defended his Ph.D. thesis entitled "Metal Doping Effects in YBa2Cu4O8". He is currently Director of Sponsored Programs along with Professor and Department Head of Electrical Engineering Technology at Bluefield State College, Bluefield, WV. Dr Michael Tenhover and his wife Mari recently visited Cincinnati. He is a Cincinnati native. 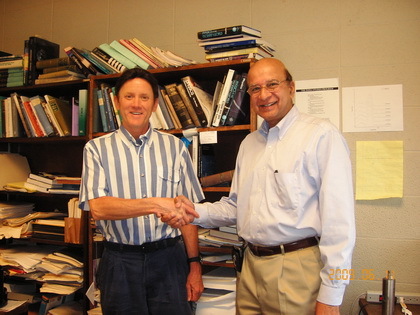 Mike Tenhover started his scientific career working on amorphous materials and magnetic Heusler alloys in the early seventies as an undergraduate in Physics at UC with P. Boolchand. He received his Ph.D. in Applied Physics at Caltech, and worked for 16 years at SOHIO (later British Petroleum) to become BP Chief Scientist in Advanced Materials, and Director of the Carborundum Technology Center in Niagara Falls. During this time Mike was awarded 36 US Patents in topics such as amorphous metals, rechargeable batteries, ammoxidation catalysis, electrochemical anodes, ceramics, aerospace composites, microelectronic packaging, and powder processing. Mike also twice received the Carborundum New Product of the Year Award. Dr. Tenhover then moved to New York City as Vice-President of Technology for the American Division of the Hosokawa Micron Company, and a few years later to the Hosokawa World Headquarters in Osaka, Japan as Chief Technology Officer. There he was responsible for all new product development and the seven Global R&D centers of the Hosokawa Group. In 2003, he left Japan and started a technology consulting company, Tenhover Consultants, in Oceanside, California. The company primarily deals with manufacturing technology related to pharmaceuticals, powder processing, oil& gas production, chemicals/catalysis, solar energy, and other alternative energy topics.